It was my birthday and being the grand old age of 29 we decided to go for a civilised meal. It all went wrong when we decided to go to a restaurant that was BYOB. At 6pm. 3 hours later Yours Truly was on stage with a live band belting out Proud Mary like she was Anna Mae Bullock herself (check that one out – fact fans!). I can see from the look of horror on your face that you already have some concerns regarding this scenario. This is probably because you’ve seen me do this before, in which case you may as well stop reading…no don’t I didn’t mean that! If you haven’t been witness to my Tina Turner impression, imagine the worst thing ever, then add music. If I’m honest -it would be easier to list the people who haven’t seen me do it. I’d love to say it ended there but no, of course it didn’t. By the way – this was not a karaoke bar. This was a bar/restaurant with a real live band and real live paying people. Not only that but it is right round the corner from my parents’ house. I knew half the people in there, and if they didn’t know me then, By Jove, they do now. Not enough blog in the world to answer that question, Shakira! To add insult to hair-flick-induced whiplash, I must mention that I am as good at singing as Stevie Wonder is at playing “I Spy”. After an unsuccessful attempt at musical theatre when I was 12 I have come to terms with the fact that music is not my forte. And yet, I continue to humiliate myself by singing in public. And I do the dance. Because when I dance on my bed cartoon leaves float around me too. 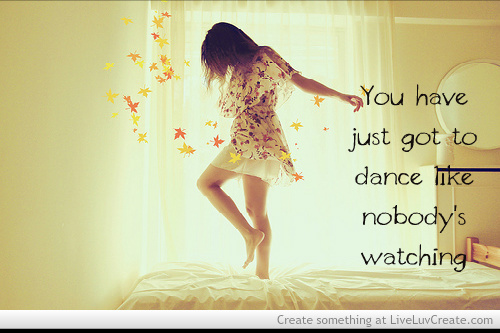 Dance like nobody’s watching is the worst advice. Ever. Sophie Fox, aged 29 years 3 days, was last seen at this bar. She was talking about waitressing in Memphis and pumping gas in New Orleans. Whilst her current whereabouts is unknown, sources say she may have jumped on a RiverBoat Queen before the beat kicked in and she appeared to have an epileptic fit. If found, approach with caution. Even Chezza is cringing and she has that god awful tattoo! Speaking of horrendous singing and undeserved self-confidence. X-Factor is back – awooo. Don’t know why I’m saying “awoo”, like a camp owl – I hate that show. Mainly because I fail to see how these people can be so naïve that they think they can sing. If I wanted to watch deranged people publicly humiliate themselves I’d watch the video of me from Saturday night. Just when you think it couldn’t get any worse. I read a great article by Sunday times columnist Katie Glass this week. In it Katie talks about how in this digital age we are all so obsessed with our phones that we take fewer risks and are less spontaneous. She gives the example of how the days are gone when you could push someone into a pool without them screeching about their iPhone/Kindle/Tamagochi and how people are so obsessed with recording everything that we forget to actually enjoy whatever it is we are looking at. I don’t think there was any danger of people not looking at me on Saturday but I clearly didn’t mind. What I do mind are those people (Sarah Finney) who insist on videoing it. Does it look like I ever want to be reminded of this?! Kate Bush banned phones from her recent concerts because she wanted the crowd to actually experience the music for themselves in that moment. I am thinking of enforcing the same rule amongst my friends. Unless there is a world-wide ban on the playing of Proud Mary in public spaces, I’m probably going to sing Tina Turner again. When I do, I will invoke The Code of Kate Bush and all mobile phones and recording devices must be switched off for the duration of the song. 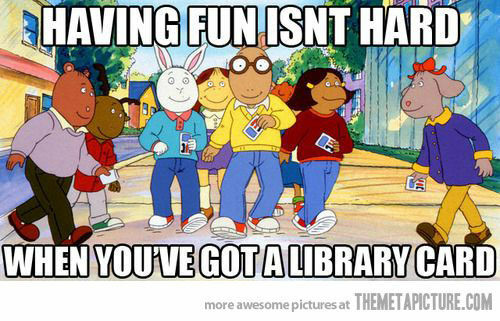 It’s either that or go to music-less places and, as far as I am aware, they don’t let you drink in the library. More’s the pity. ..”But I’d care less about paying a fine, If it came with a large white wine.” Thank you. Goodnight. Aside from my cringeworthy stint as the lead singer of a jazz band, this week has been pretty good. My stay-cation went very well. My new baby and I are very much settled in at home with mum and dad. There are a few teething problems that need to be ironed out and it is safe to say I did none of the things my mum asked me to do: unpack, pay your bills, don’t get fake tan on the Good Towels. So far so good, except for the towel thing but she’ll forgive me in time. This weekend is shaping up to be pretty exciting too. For the moment I’d like to thank you Dear Reader for once again letting me offload. I feel much better for it and I am a little less embarrassed by my weekend antics. I’m sure you lot got up to much more ridiculous things than a bit of a sing-song. Please let me know what they are so I can feel better about myself. p.s. Huge apologies to the people at House bar. Don’t worry I wont be coming back for a wee while. You go on with your bad Tina Turner-self, girl! I think it’s awesome that you got up there and belted it out, dance and all. Frankly, I don’t think I have the balls to do something like that. I was singing/dancing in my car this morning to T. Swift’s Shake it Off when a guy walking by stopped, actually stopped, by my car, stared, and then to my horror, starting clapping. I was mortified! So I feel ya, I definitely feel ya. Have a fantabulous weekend, my dear!